God Help the Girl, the new film by Belle and Sebastian mastermind and first-time writer-director Stuart Murdoch is, however improbably, the best movie musical I’ve seen in years. And I’ve been seeing some musicals. It’s been more than a decade since the likes of Moulin Rouge! and Chicago made a concerted effort to bring back the genre that had been sleepy, borderline nonexistent, for much of the eighties and nineties. In that time, there have been several hits the genre: Les Miserables, Mamma Mia!, Hairspray, and Dreamgirls all made good money, which is probably why both Into the Woods and a new Annie get the big-screen treatment this Christmas (though their trailers still don’t seem comfortable with the notion of selling them in their actual genres). Cinematically speaking, though, a lot of these movies are uninspired, at least in terms of reasons to get excited about the long-dormant genre. The big hits have all been adaptations of Broadway shows, mostly clumsy; Les Miserables came the closest to applying an actual audio-visual strategy to its material, and in the style of director Tom Hooper, it pretty much hit its marks (extended-take close-ups, recorded-live singing, CG sets for scope) over and over, wearing a rut in the floor.The better recent musicals have been outliers of sorts, whether due to the more musical-friendly medium of animation (Frozen, which has a song-heavy opening and the near-instantly iconic “Let It Go,” but relatively few songs in its second half) and family entertainment (the excellent revival of the Muppets series, with its witty, catchy Bret McKenzie songs), a focus on dance performance rather than songs (the Step Up series), or a choice to stay on the non-integrated style of in-movie performance whenever possible (the masterful kinda-musical Inside Llewyn Davis; the less masterful but HBO-friendly Pitch Perfect). 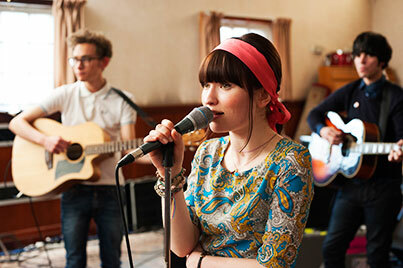 Though God Help the Girl involves the formation of a band, it is much more of a musical than that premise suggests. John Carney’s Once, similarly low-budget and charming accented, toyed with how much of a musical it could afford to be, to great effect; recall the beautiful scene of its heroine singing along to her Walkman as she walks down the street at night — the backing track of her disc bleeding onto the soundtrack. When Carney repeated his formula for Begin Again, part of that movie’s mainstreamization involved making sure the music was non-integrated and performative, rather than anything even slightly resembling a production number. God Help the Girl has production numbers; it announces this almost immediately. In the opening sequence, set to a rewritten version of Belle and Sebastian’s “Act of the Apostle,” Eve (Emily Browning) looks straight at the camera as she sings about her plight, and as the camera follows her out of the hospital window, down the street, and onto a train, bits of the song lyrics materialize as visual gags. It’s stylized, cut together in ways that make it impossibly unreal; though later numbers will have visible instruments, here the accompaniment is invisible. In other words, it’s not unlike a music video. This is a criticism I’ve heard repeatedly of God Help the Girl: it is essentially a long-form music video with some non-music stuff in between. Music videos have been both the death and rebirth of the live-action movie musical — unfortunately more of the former than the latter, though sometimes both at once. But stereotypical music-video aesthetics — a certain level of flash or high-concept storytelling; fast cutting (although plenty of videos specifically utilize stunt-like long takes, sometimes the full length of the song); heavy stylization in the form of dramatic camera angles, odd costumes, special effects, and so on — are all essentially tools that make the visual presentation of music more dynamic and cinematic than the traditional proscenium framing of older movie musicals. They also, back at their inception, started making old-fashioned musicals look, well, old-fashioned — though truthfully, that process probably started with the grittier and less outwardly glossy New Hollywood films of the late sixties and much of the seventies (including music video’s own ancestors on film; more on that momentarily). Or we can just be concise and say that musicals were killed by that Dr. Doolittle movie with Rex Harrison and then Carol Channing buried the corpse. Anyway, dismissing God Help the Girl as a long-form music video: not a complaint I can really understand. It’s akin to calling action movies shot with a handheld camera pseudo-documentaries. It’s a technique, not a clumsy transformation. In the case of Girl, shooting production numbers like music videos is a technique that happens to derive from feature films like the frolicsome, gag-heavy A Hard Day’s Night, which this movie explicitly and hilariously references. (It also tosses in a wink at The Sound of Music, to complete its homage to what was happening in music-centric movies circa the mid-sixties. In ’65 and in 2014, traditional musicals still struggle to keep up.) Modern movie musicals should, in some ways, resemble long-form music videos, because music videos come from where movie musicals were going. The idea that a musical should ideally use long takes to luxuriate in the performances on display speaks to an extremely narrow view of how to depict music on film — sort of like complaining about whether actors can really belt it (not all of them can, and yet: Sweeney Todd is a much better movie than Dreamgirls; go figure). Moulin Rouge! is the best movie musical of the best I-don’t-know-how-many years, because Baz Luhrmann is, if nothing else, unafraid to use everything in his filmmaker’s toolbox. Many of the other big recent musicals fall in a weird in-between state: Rock of Ages and Hairspray could afford the big stars and sets and fancy camera moves, but no one told Adam Shankman how to actually cut musical numbers together, only that there must be cutting of some kind. Similarly, Rob Marshall’s Chicago and Nine both (as I’ve complained countless times) set their musical numbers on sets that look like minimalist Broadway sets, then cut them into MTV hash, utilizing a brave Worst of Both Worlds approach. The result manages to be both middling stagecraft and shrugworthy filmmaking. Still, those are extreme examples. To surpass Rock of Ages as a musical is like surpassing Transcendence as science fiction. What further unifies the pseudo-videos of God Help the Girl and keeps them feeling like an anthology of Belle and Sebastian shorts are their point of view. As an integrated musical, the movie needs not explain where its music comes from, though sometimes it kinda-sorta comes from the characters playing music onscreen. The easy out would be to say that the more fanciful aspects — the props on Eve’s train ride; the psychiatrist coat she dons for “The Psychiatrist Is In”; the choreography no one seems to have worked out ahead of time — come from Eve’s troubled mind, but the movie thankfully avoids Rob Marshall-style bending over backwards to explain away its genre. The songs happen, with and without instruments, because it is a musical. Eve’s point of view (and, to a lesser extent, the compatible but separate points of view of James and Cassie) explains the sensibility of those musical numbers, which ranges from whimsy to longing to worry to joy, sometimes within the same song. The visual interpretations of these songs, then, complement the characters and bring us further into their world. They express something besides the song itself. This may sound like the barest minimum for a musical, but (a.) most modern musicals I’ve seen do not do this and (b.) what God Help the Girl expresses about youth, creativity, recovery, and the power (and limitations!) of pop music has more complexity and personality than most musicals bother with. Even some of the more positive reactions I’ve read note that the musical sections are delightful but there’s a whole rest of movie described by turns as rough (in filmmaking) or wandering (in narrative). Again, not really getting it. Beyond Murdoch’s slightly amateurish direction of his actors — they sound a little under-rehearsed in the purely technical sense — and a few awkward cuts, the filmmaking is solid: textured, immediate, with lovely color schemes. More importantly for the narrative, God Help the Girl spends a lot time with its characters, even when they’re not doing much besides spending time with each other. As a movie, it has the luxury of filming hangout sessions that probably wouldn’t make the cut on stage. By inserting musical numbers into a movie that feels intimate and handmade, Murdoch merges fantasy and reality, and this is a correct approach: fantasy and reality are often more related than they initially seem. This immersion into the characters’ world gives the movie some emotional heft. As funny as some of the sight gags are (which I’d rather not spoil, laboring under the maybe-misapprehension that everyone who reads this will rush out and see the film), and as charming as the small-scale dances are, the movie maintains a sense of danger in a later number like “Musician Please Take Heed.” If the narrative (such as it is) must dip down and soar up, sometimes seemingly at random, it accurately reflects Eve’s fragile, recovering mindset. It’s entirely possible that if more filmmakers made personal, idiosyncratic musicals with catchy original songs, God Help the Girl wouldn’t seem quite so special. But then, if more movies were great, yeah, maybe the bar for greatness would get raised, eventually. And musicals, especially, need all the help they can get. The seventies film brats all seemed to want to make musicals; only De Palma really went after it with Phantom of the Paradise, while Coppola and Scorsese experimented with One from the Heart and New York, New York, respectively (musicals where the characters don’t exactly sing and dance, but sometimes do one or the other), and Spielberg flirted with the form so many times (1941; The Color Purple; the beginning of Temple of Doom) that his obsession-plus-avoidance has started to seem pathological. I love these misbegotten experiments but I wonder if they scared off today’s equivalents from further updating the genre. Where is the musical from Michel Gondry, from Spike Jonze, from Paul Thomas Anderson, from Sofia Coppola? They all use pop music beautifully in their movies and/or trailers, but seem wary of the form. I don’t know why. I don’t know why the first-time director whose day job is singing took it upon himself to make the most purely enjoyable musical film I’ve seen in ages. I do know this: the morning after I saw God Help the Girl, I woke up happy that it exists. The movie took me someplace — no small thing.